Northants head coach David Ripley says he is proud of his side's performance in the four-wicket defeat to Yorkshire Vikings at Headingley on Thursday. But Ripley admits the overall showing in the Royal London One-Day Cup has been 'disappointing'. 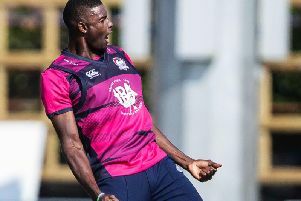 The Steelbacks suffered their fifth defeat in eight North Group games as they were edged out by the Vikings. Former Northants star David Willey hit 71 as his side reached their 242-run victory target with an over to spare. Earlier, the Steelbacks had recovered from a poor start to register 241 all out after winning the toss and electing to bat. Charlie Thurston top scored on his Northants debut, hitting 53, while Alex Wakely made 42 and Graeme White racked up an unbeaten 41 from 39 balls. Rob Keogh then produced a fantastic bowling performance, claiming figures of two for 26 from his 10 overs. But it wasn't enough as Gary Ballance (66) and young wicketkeeper Jonathan Tattersall (52no) led Yorkshire home. Northants finish third from bottom in the North Group, having only beaten Nottinghamshire and Lancashire. And Ripley said: "Our performances have been a bit up and down. "We haven't had a strong competition, but we fought hard against a strong Yorkshire. "We visibly competed in the field and, at times, looked like we were shading the game. "We also competed hard with the bat. We were 20 for three in the powerplay with not the depth we could have had in our side given injuries, and we scrapped our way to a score that looked competitive if we started well with the ball. And we did. "We're walking away fairly proud of our performance, but ultimately the campaign has been disappointing. "Nobody in our side has got a hundred and the batting stats weren't that strong."